Has your property just experienced a water-related incident? Immediate inspection, mitigation, and remediation go a long way in preventing further destruction and its associated costs and disruptions. You have a very brief 24-48 hour window of opportunity to have everything clean and safely dry, and technical expertise is essential. 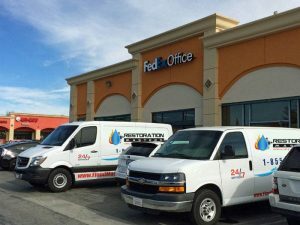 Our licensed and certified commercial water damage restoration crews are experienced in everything from small retail and restaurant overflows to commercial flood services for office complexes and big box stores. And a lot more. We’re the single-source solution for building owners, business owners, and property managers. Understanding all the risks — health and safety, downtime, and loosing customers — we’re ready to roll 24 hours a day, 365 days of the year with always fully-stocked trucks. Our commercial water damage restoration services attend to the building, HVAC, electrical appliances, furniture, carpet, and more. It all begins with a thorough and expert inspection, and continues with photographic documentation and extensive notes along the way. You’ll always be up to date on our findings and actions. We understand how large companies often self insure, so we always work to minimize restoration costs and keep downtime to a minimum. Whether an actual fire or a malfunction activated fire sprinklers quickly flood large areas with standing water. Immediate Category 1 water removal and surface extraction prevents that from becoming a Category 2 flooding biohazard and paves the way for fast structural drying with a minimum of complications. Note: Immediate shut-down critical. 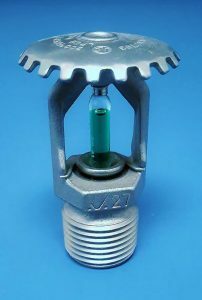 One source estimates that on average each minute a fire sprinkler systems runs adds some $1,000 in direct recovery costs. In addition to fire sprinkler water damage mitigation, prompt action by professionals minimize disruption to tenants and customers (in addition to work crews in the case of construction-site activations). Anyone can manage pump-out and debris removal, but it takes certified applied microbial remediation technicians such as ours to properly manage IICRC Category 3 (black) water with its extensive decontamination and sanitizing requirements. 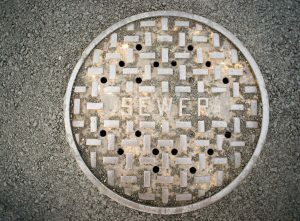 Whenever sewage contamination is involved they will isolate against the spread of airborne disease organisms and sterilize or replace all building materials that have come in direct contact with sewage. Our crews also follow all regulations and guidelines for the proper transportation and disposal of wastes. If you stop at extraction, you’ll likely face additional deterioration in the weeks to come. In a matter of just a few minutes dampness reaches deeply enough that it takes weeks to fully evaporate. 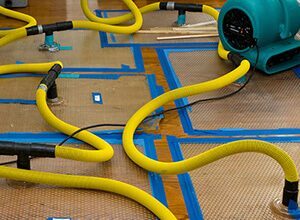 Our structural dry out experts set up refrigerant dehumidifiers and air movers (and in some cases specialized heating equipment) to quickly bring down humidity and forestall harm to documents, media, furniture, and building elements. 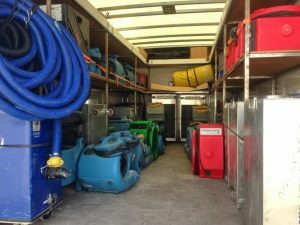 After rapidly executing any needed pump-out, our truck mounted water extraction gear takes care of surface water extraction from carpet and other flooring, walls, ceiling tiles, cubicle partitions, and furniture. We use state-of-the-art gear superior to most cleaning services, and easily twice as effective as any janitorial do-it-yourself methods. After any water damage incident, it’s important to avoid sick building syndrome. 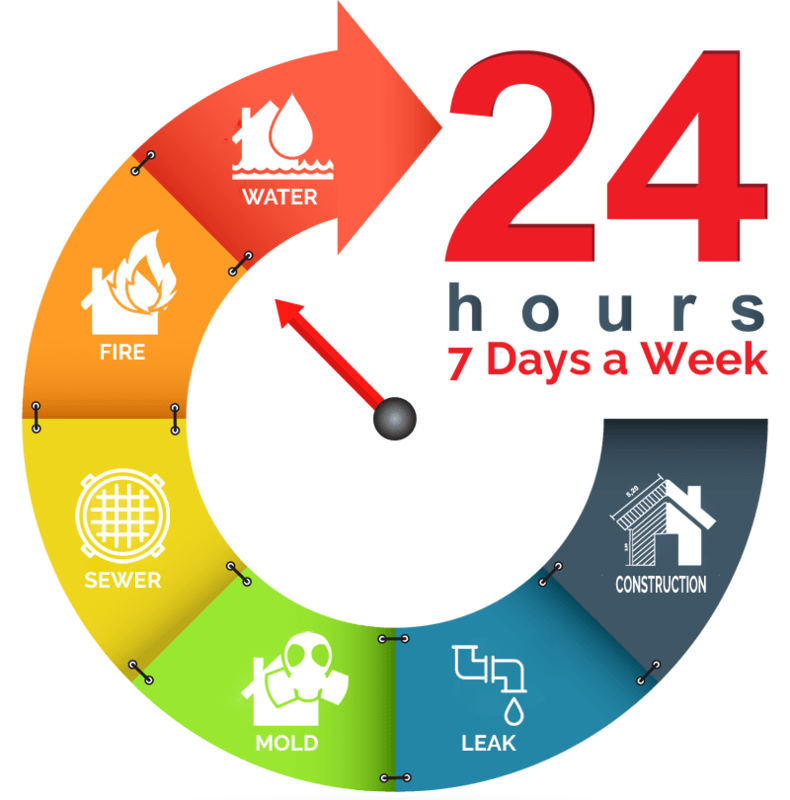 Prevention is paramount, but if a mold outbreak should occur, our licensed mold removal crews can take care of it. They follow all isolation, removal, transport, and disposal regulations and guidelines to the letter. Our antimicrobial treatments, including HEPA air scrubbing, air duct cleaning also work towards restoring air quality. Our first line of attack is using the right cleansers and procedures for surface cleaning. To deal with smells originating from beneath the surface, including inside walls and other difficult or impossible to reach places, our foggers, ozone generators, and hydroxyl generators produce gasses that safely break down odor-causing compounds then dissipate. 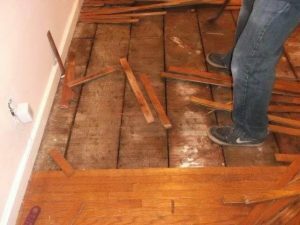 To complete our commercial water damage restoration services we employ certified upholstery and fabric cleaning technicians as well as licensed general contractors to complete flooring, drywall, cabinet repairs. Locally owned and operated, we’re a licensed and insured restoration company, equipped with the latest equipment for full-service commercial work. 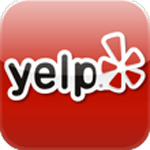 We’re known throughout the greater Los Angeles region for our technical expertise and outstanding customer service. 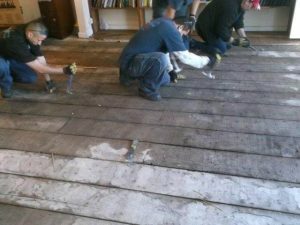 Our philosophy is customer satisfaction by putting mitigation first. That includes starting anytime 24 hours a day and working overnight for faster dry out and minimal downtime. We accept all insurance companies and have working relationships with leading companies serving the greater LA area for hassle-free claims. Our highly competitive rates also help self-insured corporations. With everyone working together as a team we’ll restore your commercial facility to full functionality as quickly as is safely possible. 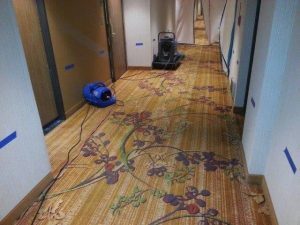 Our commercial water damage restoration expertise and experience include apartment and condo complexes, hospitals, hotels and motels, malls and shopping centers, office suites and complexes, restaurants and food service providers, schools, warehouses, and light industrial.